Join the 16th Century masked ball in celebration of the 487th birthday of St. Augustine’s founder, Pedro Menendez de Aviles (1519-1574) who with 11 ships and 2,000 soldiers attacked Fort Caroline butchering every Huguenot (men, women and children) and hung some from the trees as an example to others. But all are welcome on this festive night ! Guests will be escorted to the birthday ceremony by re-enactors in period clothing. Dinner will be catered by the Casa Monica Hotel, followed by dancing to the contemporary tunes of the "Royal Court Musicians".Attire is black tie or 16th century costume. Admission is $150 for Historical Preservation Trust members, and $175 for the public. The Gala begins at 6:30 p.m. at the Lightner Museum. Reservations are required. This event is the main fund-raiser for the St. Augustine Trust for Historic Preservation. For more information call 904.825.5088.
" .......the English landed at Jamestown, which provided the roots for representative government, commercial enterprise and ultimately the birth of the United States. It brought three cultures together that would become uniquely American as they sorted out - and continue to sort out - their conflicts and strengths. "And St. Augustine’s lasting claim to the enterprise that is now America? Perhaps the Fountain of Youth." The above qoute from Lynchberg ,Virginia (home of Jerry Falwell´s, Liberty University (creepy))is a definite rude statement by a biased writer. As we all know Jamestown was founded 42 years after Pedro Menendez established(1565) St. Augustine amongst the Timucuan natives in the village of Seloy. 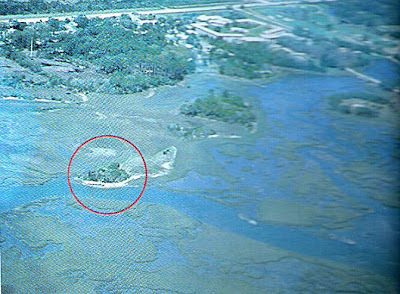 The French had established a fort near present day Jacksonville the year before. Jamestown, the village faded into the soil by 1700.You will find many re-creations and re-enactments up there in what was the Jamestown area but you will not find any ancient buildings or landmarks. Henry Ford has already created his idea of early America in Dearborn , Mich. Walt Disney has done his version throughout the world and wouldn´t Disney Corp. love to build on Gettysburg or Bull Run. St. Augustine is real and tangible history that we can see and touch. NOTE:Art In The Market apologizes. We are in Font Confusion and hope that we have finally settled on the right size that satisfies all.Wewill also be "on the road" for awhile and there will be a lapse in regular posts. Later. This photo was taken approximately seven years before Italian sculptor, F.Romanelli installed the two Carrera marble lions at the foot of the new bridge.Dr. 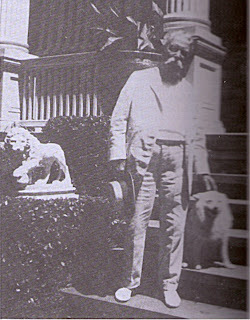 Anderson commissioned the works but died at age 85, three years before the installation.Note the small maquette to the left of Dr. Anderson on Markland´s (King St.near the Post Office) front steps. Dr. Anderson was the benefactor of the Ponce De Leon bronze, the Armistice flagpolewith ornate bronze base and the birdbath all in or near the Plaza De La Constitucion. Are the small Lions still there? We will check. Meet The Snapple Lady. Five Bucks. Brought to You by Jeep and Snapple ! 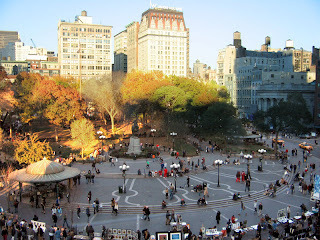 Union Square ( & the Plaza De La Constitucion) is a traditional historic forum for all citizens. Recently, Art In The Market almost fell into the commercialism trap by suggesting that the City of St. Augustine lease to vendors, an area near the new parking garage. A jury of fellow vendors and outsiders would limit items to handmade and give priority to St.John´s County residents. This nominal lease would give vendors the ability to restrict and control. Wait a minute!, Hold on here! How easy it is to be lulled into self interests! Our public parks and right of ways should not be for sale or lease to the highest corporate or private bidder, prohibiting a citizen sector (those we choose) to utilize what is a right. Our parks are available if the price is right?? Should we relinquish our public rights to private interests? Read a favorable article about BIDs (Business Improvement Districts) Here and look for the possibility of abuse. No Soup For You,Quigley ! We have always asked our artists in the Plaza to speak cautiously to the press. 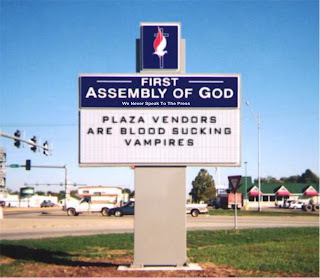 One of our own referred to the Plaza vendors in the vernacular above on the church sign. He was referring to two or three bad examples of mercenary vendors in the Plaza. Our vendor friends were generally "just plain middle class folk" looking to supplement their income. Generalizations almost always lie. Reading letters to the local paper it would seem that the public equates the vendor and the homeless panhandler as being in the same sub species of human. One letter writer, a Reverend, had written that if the vendors were not permitted in the Plaza, they may revert to a "life of drug usage and possibly home invasions!" Let me warn you in advance, Barb and Sis (vintage costume jewelry) are now out of the Plaza. These two may break into your home to serve you and the kids soup and crackers. Barb will slowly bore all of you to death with stories of her latest surgery while Sis is dusting and cleaning. It´ll be horrible. These are a couple of the most menacing 150 years of combined womanhood. Be on the lookout at nearby craft shows and Farmer´s Markets. It was not our artist´s intention to assist the St. Augustine Record reporter in demonizing the commercial vendors in the Plaza. The quote was misplaced in context. He is in hiding. At tonight´s City Commission meeting(5 1/2 hours long) there was discussion regarding commercial sales within the Plaza De La Constitucion (the nation´s oldest public space). Our vendor friends did not come up with a viable alternative to present to the City. One of our favorite young artisans (torched glass), Trevor, the father of two beautiful children, finally spoke up and seconded Commissioner Crichlow´s idea of an alternate space near the parking garage. This was Art In The Market´s suggestion to many vendors and we were pretty much convinced that we were talking to brick walls.Trevor took off with it and we hope that this alternate space comes to pass. With the exception our new mayor Mr. Boles, an attorney, the commissioners seemed to understand that visual artists are Constitutionally excepted from the vendor ban. Mayor Boles felt that artists must be painting or producing on site. As an art gallery owner and artist he felt that it would not be "right" for someone to set up an outdoor gallery on public property. He requested that the City attorney research the law to see if this can be put into place. 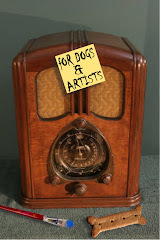 ........The courts write that the "display and sale of visual art" is protected under the First Amendment. Just as the sale of printed material is protected under free speech ,so is visual art. For full First Amendment protection I do not need to be the author of the books and periodicals offered for sale. If I am the author, should it be law that I sit in the Plaza and write as I offer my book or periodical for sale. We invite artist and gallery owner, Mayor Boles to join us in the Plaza to show his work and other works from his gallery. We believe that the mayor is confusing us with street performers. Take a look at the work of Art In The Market artist, Sala, recently arrived from Barcelona. It would be very difficult for Sala to haul her textile sewing machine out to the Plaza. It would be just as ridiculous for photographer Elena Hecht to be sitting there clicking the shutter on her camera as some sort of performance. Suvo says that he´s tired of turpentine and sloppy studios. he´says that going to go partially digital, clean up his Hwy 1 studio and paint with his mouse or stylus. Mr. Mayor, do not presume to tell us what to create or how and when to create our works. Later .we will address a statement by artist (not a Plaza artist) Toni Dewitt-link ( interesting pastels)that she questions whether photography and prints are actually can be considered "art". Lord deliver us from dilettantes and dabblers! We are sputtering with indignation right now. ....Can´t type. At the age of 64, Heade settled in St. Augustine, Florida and married Elizabeth Smith. Henry Morrison Flagler, a partner of John D. Rockefeller's in the Standard Oil Company, discovered St. Augustine at about the same time and was determined to make it "the Newport of the South." In 1888 he opened the magnificent Hotel Ponce de Leon, including seven artist studios, which attracted potential buyers for the resident painters. 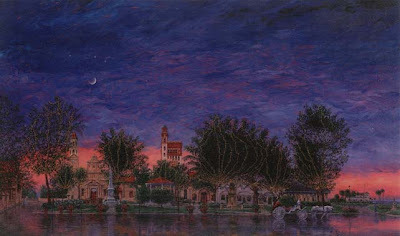 Heade was invited to occupy one of these studios, and was supported and encouraged by Flagler until his death in 1904. 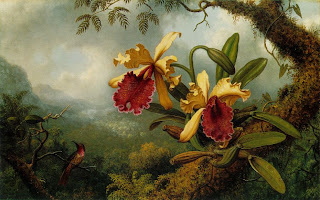 Heade created more than 150 works in between 1883 and his death, focusing on the exuberant landscapes, flowers and fruits of the American South - yet another new subject for the painter. 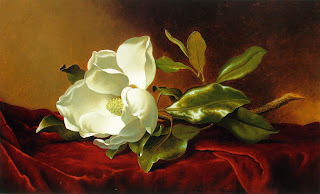 A recent exhibition included five St. Augustine works of Heade's sensuous magnolia blossoms, including Two Magnolias and a Bud on Teal Velvet (1885-95), a work that was recently discovered at an estate sale before being sold for over one million dollars, as well as the magnificent Giant Magnolias on a Blue Velvet Cloth, recently purchased by the National Gallery of Art, Washington, D.C. Here is a recent e mail from Robert Lederman, a street artist who has waged three federal lawsuits for his First Amendment rights to display and sell his art in the public fora of Parks, and sidewalks. "When people criticize street artists and seek to restrict us, it is usually in response to our overly zealous pursuit of our private financial purpose. The familiar complaints are that we compete with stores, take up too much valuable sidewalk space and add to pedestrian congestion.When people praise us, it is usually in response to our pursuit of the public purpose. That public purpose manifests in many ways, from beautifying the streets with our art, to engaging people in stimulating conversations to standing up for the public's right to free speech.These two purposes are mutually dependent, and that is exactly how the founding fathers saw them when they wrote the US Constitution. To the extent that we achieve a balance between these two currents it brings about a harmonious environment in which everyone can coexist and benefit." 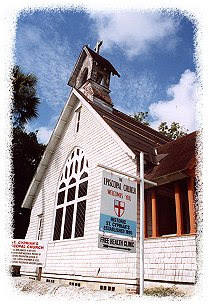 St. Cyprian's Episcopal Church, located in Lincolnville, in downtown St. Augustine, Florida, will be featured in the February 2007 issue of Odyssey Couleur, a bi-monthly multi-cultural travel magazine. 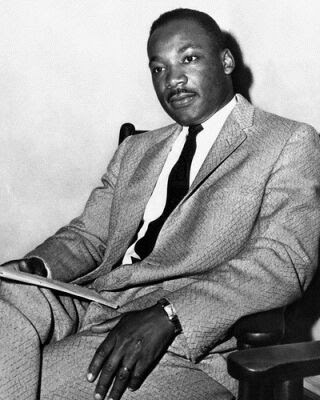 Our City has close connections to Martin Luther King. It is a a nice thought to picture a 78 year old Dr. King revisiting this city where there was much antagonism toward his 1964 visit to push for integration in the nations oldest city. He was a true American hero. More from historian David Nolan. A memorial near the Plaza is needed. Randolph Caldecott´s Grave - Evergreen Cemetery, St.Augustine Fl. The Library Main Branch in St. Augustine has named the Children´s section after Randolph Caldecott. Randolph Caldecott (1846-1886) transformed the world of children's books in the Victorian era. Children eagerly awaited the two books illustrated by him, priced at a shilling each, which came out each Christmas for eight years. Late in 1885, Mr. and Mrs. Caldecott sailed for America, once more in search of health, promising The London Graphic a series of sketches illustrative of American life. Unfortunately, the terrible winter weather and his poor health left him with little strength to work, and he died on February 13, 1886 of organic heart disease in St. Augustine, Florida, in his thirty-nineth year, "at the height of his powers and reputation". This is a microcausm of a purely American issue. What is at stake? The issue is.........What rights does an individual hold concerning public property. Does a Governrment "own" this property and can do with it as it sees fit? We believe that the large majority will say that the government is the "steward"or "caretaker / administrator "of property held in public trust. Does administration require government to provide individuals a place to do business on public property? We see over and over that states,cities and townships are privitizing public spaces by leasing them out to commercial interests. This is a dangerous precedent. We believe that the stewards of our public spaces are not required to provide space for private commercial enterprise. One exception is for fundamentalFirst Amendment issues. The definition is not difficult and we have harped on this before.Case Law up to the U.S.Supreme Court has determined what type of art is eligble for full First Amendment protection which includes the SALE of such expression. You may wear your own uniquely designed jewelry, hair beads,magnetic theraputic bracelets etc. and no one can stop you. This is Freedom of Expression. Can you sell it on public property without a permit? NO. Full First Amendment basically covers press, written materials and visual art (for simplicity sake lets call visual art "pictures". In the words of Rod Stewart, "Every Picture Tells A Story". Art In The Market saw little concern by commercial vendors when one of our artists questioned the abitrary and unequal enforcement by the City when it came to a small minority of visual artists. This artist has been sent to court and shut down three times by the city and the cases were dropped on the day of the court hearings. One case is still pending and the City is lagging on assigning a court date though the alleged offense (displaying art on St. George St.) occurred almost a month ago. 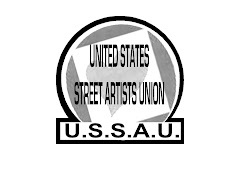 The artists are small in number but their resolution seems much greater than those vendors who are simply fighting so that they can continue to make good money. At the risk of sounding all high and mighty, we visual artists have altruistic principals at stake. The new City Attorney Ron Brown stated at the last Commission meeting that his office was looking into permitting "expressive"works in the Plaza. Let us stress that "expressive" works are not neccessarily protected with Full First Amendment rights. It is the" sale of......" that the courts have interpreted. Our paintings may be displayed and sold just a newspaper can. The money does not diminish First Amendment coverage. 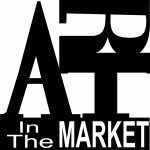 Watch for talk of juries, a lottery system, limitations on products ,etc.. Art In The Market takes the stance of an interested observer. If the City mistakenly begins applying these rules to the visual artists we will be more proactive in this heated debate. Commissioner Burk - Mucho Grande Pelotas ! If you have read the previous post you will see that the City has suspended permitting for vendors in the Plaza. This does not apply to the visual arts. (paintings, prints, sculpture or photographs). A Few points must be brought up regarding this special meeting and the repercussions of the City Council's actions. Was this meeting a violation of the Sunshine Laws?, meaning was it posted as to time and place at least twelve hours in advance?...........Yes, we were aware of a meeting on the 22nd to discuss a Homestead Exemption issue as the agenda stated. These meetings are usually held at 5 Pm at City Hall. Inexplicably, this meeting was held at 9AM and the majority of discussion was in regards to the vendors in the Plaza. One would guess from the tone of the commissioners ( we heard the tape) that this was discussed previously at least by a couple of commissioner's. Difficult if not impossible to prove. Jewelry vendors still continue to set up near visual artists though the ban has been in place almost one week. When questioned, the jewelry vendors state that the City approved their products as visual art protected by First Amendment.Today there were two artists and two jewelry vendors. 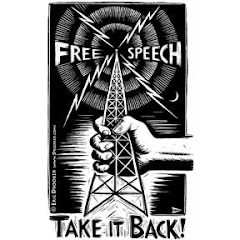 Commissioners , commissioners, the First Amendment protects free speech and press. According to Federal Court, jewelry is not in this category whether it is hand made or not. One reason for the past problems is that the Licensing department was unsure of First Amendment qualifications for artworks. Be decisive, it´s not that difficult. City Manager Harris´quote from a few years back '' In the long term, we have to let them sell their products.'' was based upon faulty legal advice. Commissioner Gardner referred to a recent lease agreement in NYC that permits a hot dog vendor a 8x10 space on the sidewalk in front of the Metropolitan Museum of Art for $35000 a month! Here is another example Mr. Commissioner.......In NYC´s Union Square the Parks Dept sells a concession/permit to one big company for a few million dollars which then sells space to a few hundred vendors for as much as $10,000 each per stand. A gigantic tent is erected for an entire month completely preventing the public from enjoying or using the Park, the benches, walkways etc. Most of these vendors in this Union Sq gift show sell products (jewelry, crafts, tee shirts, trinkets) the City considers illegal merchandise when it is sold on the street...the same merchandise the Parks Department normally does not allow to be sold in Parks....................So Mr. Gardner, you brought this up to illustrate what exactly? 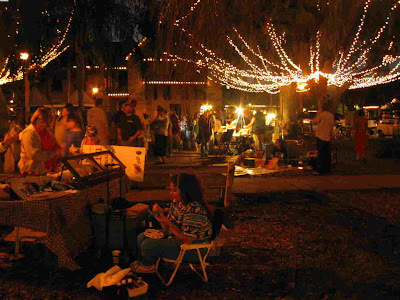 Do you propose that the City of St. Augustine look into privatization of the oldest public space in the U.S.? Are we artists the only people who view this as extremely dangerous? Our streets , sidewalks and parks are up for sale to the highest bidder? Do you see where this can lead? It´s already happening. We artists of Art In The Market have many friends vending in the Plaza. We have some regrets that they may no longer be with us. On the other hand the cheap bazaar that has evolved is very unbecoming to the City of St. Augustine. Is it possible by law to immediately change a portion of an ordinance (22-6) rendering the whole ordinance invalid? Shouldn't this go through the regular proceedings of two readings, two votes and finally public input? We have received a number of e mails from AITM subscribers protesting the City Council´s actions. We gotta say that we agree with the Council regarding the deplorable state of commercial activity in the Plaza. We disagree with the fashion that this was done without public input other than the commissioner´s own anecdotal comments. To our vendor friends who read this newsletter.........Research, read the ordinances and come up with an alternate plan. Find out where you CAN sell your goods. ..............The answer is within the City Codes.